By Dawn E. Light, M.D., Frances R. Pianki, D.O., Elizabeth H. Ey, M.D. 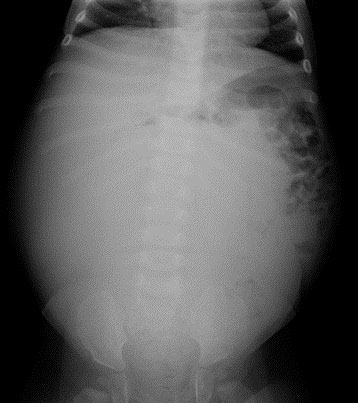 A previously healthy 8-month-old girl was brought to the pediatrician with increasing abdominal girth. On physical exam, the patient was tachypneic, and her abdomen was distended. Constipation was suspected and the patient was referred for a conventional radiograph of the abdomen, which demonstrated a large abdominal mass (Figure 1A). An abdominal ultrasound (not shown) and contrast-enhanced CT of the abdomen and pelvis (Figures 1B and C) was performed to further characterize the mass. Laboratory evaluation revealed an elevated serum alpha-fetoprotein of 394 ng/ml (reference range 0-99 ng/ml). Serum CEA and b-HCG were normal. The serum LDH was low at 185 U/L (normal range 208-274 U/L). The patient underwent laparotomy with subsequent definitive surgical management at a tertiary pediatric treatment facility. The differential diagnosis of infantile abdominal masses is broad and based on age, location, and structure of the lesion. In infants, there are 3 primary locations for masses: renal (55%), gastrointestinal (GI) tract (15%), and extension of a pelvic mass (15%).1 Ultrasound is often the first imaging modality used in the evaluation of an abdominal mass since it is widely available, does not expose the infant to radiation, and can usually be performed without sedation. The origin of the tumor can frequently be determined by ultrasound. The lesion can be classified as cystic, solid, or mixed. Vascularity of the lesion and evidence of vascular invasion should be evaluated prior to biopsy or resection. If the tumor is detected prenatally, there is increased risk of preterm delivery. In utero percutaneous decompression of the larger cysts improves prognosis.6 This tumor is often very large at initial detection, making surgical excision complicated. Although rare, cases of malignant transformation into undifferentiated embryonal sarcoma are reported.6 Although the tumor grows rapidly in young children, over time it may shrink. It may be followed with ultrasound in asymptomatic patients. When an abdominal mass is discovered in an infant, conventional radiography is often performed first followed by ultrasonography. The most common etiologies of an abdominal mass in an infant include renal, GI, and pelvic masses, followed by adrenal and hepatic lesions. By determining the organ of origin, internal characteristics, and vascularity of the lesion, the extensive differential diagnosis can be narrowed. Additional imaging with CT or MRI can be of benefit if surgical excision is contemplated. Standardized Toolbox of Education for Pediatric Surgery Abdominal Masses of Childhood. American Pediatric Surgical Association Committee of Education, 2012-13. Ranganath SH, Lee EY, Eisenberg RL. Focal cystic abdominal masses in pediatric patients. Am J Roentgenol 2012; 199:1-16. Chung EM, Cube R, Lewis RB, et al. Pediatric liver masses: radiologic-pathologic correlation part 1: benign tumors, RadioGraphics 2010; 30:801-826. Chung EM, Lattin GE Jr, Cube R, et al. 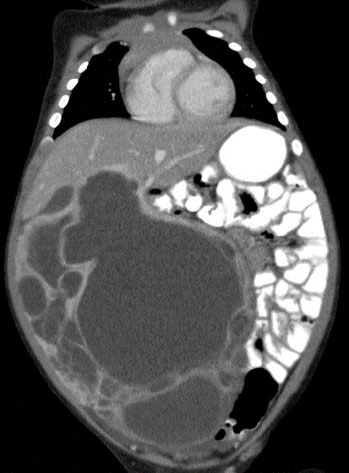 Pediatric liver masses: radiologic-pathologic correlation part 2: malignant tumors, RadioGraphics 2011; 31:483-507. Stringer AD, Alizai NK. Mesenchymal hamartoma of the liver: a systematic review. J Pediatr Surg 2005; 40:1681-1690. Siddiqui MA, McKenna BJ. Hepatic mesenchymal hamartoma – a short review. Arch Pathol Lab Med 2006; 130: 1567-1569. 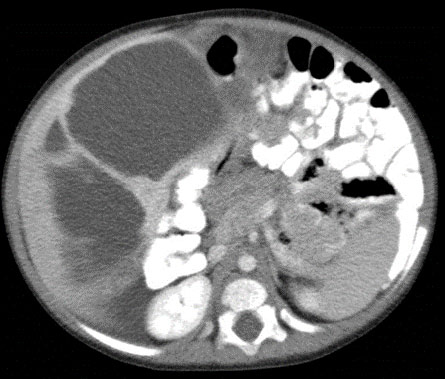 Abdominal Mass in an Infant. J Am Osteopath Coll Radiol. Dawn E. Light, M.D., Frances R. Pianki, D.O., Elizabeth H. Ey, M.D. Drs. Light, Planki, and Ey are with the Department of Medical Imaging, Dayton Children’s Hospital, Dayton, OH.